ACF Fiorentina, commonly referred to as simply Fiorentina, is a professional Italian football club from Florence, Tuscany. Fiorentina founded by a merger in 1926, Fiorentina have played at the top level of Italian football for the majority of their existence; only four clubs have played in more Serie A seasons than Fiorentina. After Fiorentina climbing back up the Italian football system in the early 2000s, Fiorentina are currently competing in the Serie A.
Fiorentina have won two Italian Championships, in 1955-56 and again in 1968-69, as well as winning six Coppa Italia trophies and one Italian Super Cup. On the European stage Fiorentina won the UEFA Cup Winners' Cup in 1960-61 and lost the final one year later, they finished runners-up in the 1956–57 European Cup losing against Real Madrid and also came close to winning the UEFA Cup, finishing as runners-up in the 1989-90 season. 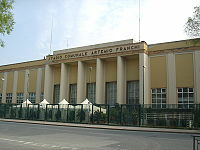 Since 1931 Fiorentina have played at the Stadio Artemio Franchi, which currently has a capacity of 47,282. The stadium has used several names over the years and has undergone several renovations. Fiorentina are known widely by the nickname Viola, a reference to their distinctive purple colours. Associazione Calcio Fiorentina was founded in the autumn of 1926 by local noble and National Fascist Party member Luigi Ridolfi, who initiated the merger of two older Florentine clubs, CS Firenze and PG Libertas. The aim of the merger was to give Florence a strong club to rival those of the more dominant Italian Football Championship sides of the time from North-West Italy. Also influential was the cultural revival and rediscovery of Calcio Fiorentino, an ancestor of modern football that was played by members of the Medici family. After a rough start and three seasons in lower leagues, Fiorentina reached Serie A in 1931. That same year saw the opening of the new stadium, originally named Giovanni Berta, after a prominent fascist but now known as Franchi. At the time the stadium was a masterpiece of engineering, and its inauguration was monumental. In order to be able to compete with the best teams in Italy, Fiorentina strengthened their team with some new players, notably the Uruguayan Pedro Petrone, nicknamed el Artillero. Despite enjoying a good season and finishing in fourth place, Fiorentina were relegated the following year, although they would return quickly to Serie A. In 1941 they won their first Coppa Italia, but the team were unable to build on their success during the 1940s because of World War II and other troubles.